There are two reasons to have your bathroom renovated: either your bathroom doesn't look the way you would like or it was not built to last in the first place. People often feel that as long as their bathroom is functional, then it’s fine. But think of this: the average person spends more than a year and a half in the bathroom in their lifetime. Given that, it's not surprising that so many people want their bathrooms to be pleasing to the eye. As for the second reason, your bathroom contains a lot of moisture, so it is important that it is built to withstand that humidity. If not, then the dampness may seep into the underlying material, weakening it and reducing its longevity significantly. Worse still, if excessive moisture really gets under the floor and behind the walls then there is the possibility of mold and mildew which can cause a number of health issues. 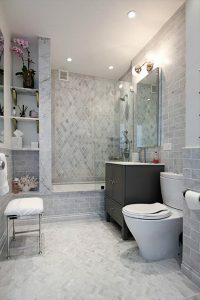 Our team of licensed and insured remodeling technicians knows exactly what materials and techniques to use to make your New York City bathroom last for a very long time. 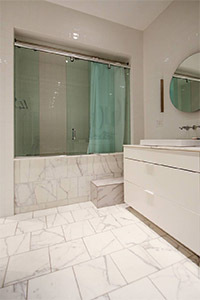 If you are not exactly sure what look and feel you would like for your bathroom, that’s no problem. Have a look at our gallery to get some ideas, or just contact us. We we will gladly help you choose from a wide variety of designs to find the one that is perfect for you and your home.